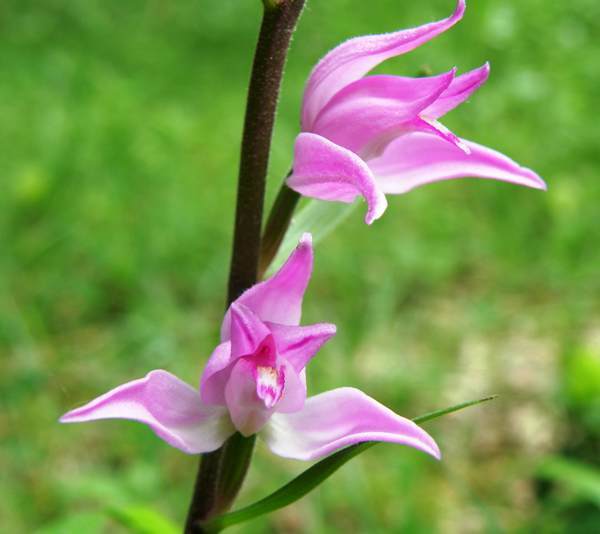 The orchid is in steep decline and is now classified as Critically Endangered in the UK. Although now seemingly confined to only three sites in the UK, it could be that there are other undiscovered plants in suitable areas. Even when in flower these orchids are difficult to spot, but when only leaves are present they are even harder to distinguish from other long-leaved woodland plants. 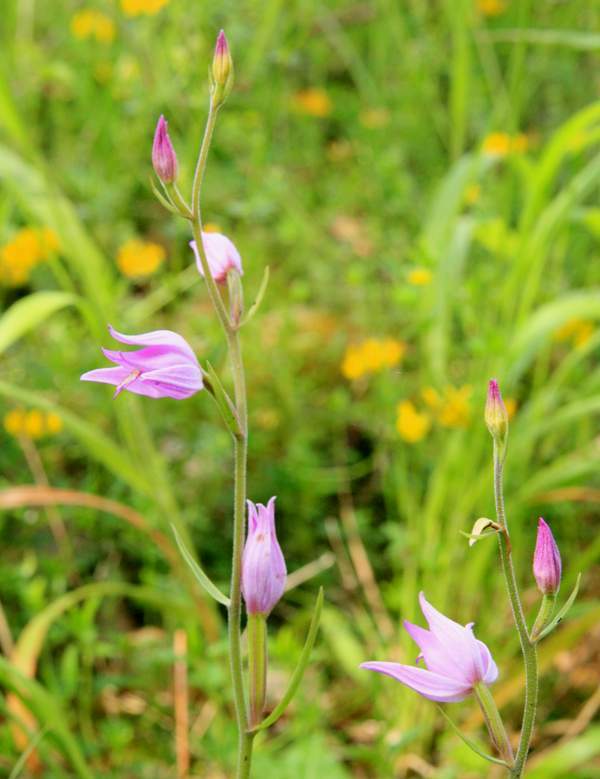 Red Helleborine grows to between 15 and 60cm in height and has slender often wavy-looking stems. The greyish-green leaves are long and narrow. The inflorescence is lax and can carry up to 17 flowers, although that is unusual with 7 to 10 being more common. The flowers are a delicate shade of pink. The Red Helleborine is now both rare and localised in the UK and probably confined solely to southern England. Fortunately these lovely orchids are not so rare in other parts of Europe, and we have seen them in southern France (in the Lot Valley) and also in considerable numbers on tree-shaded roadside verges in the Triglav National Park in Slovenia. 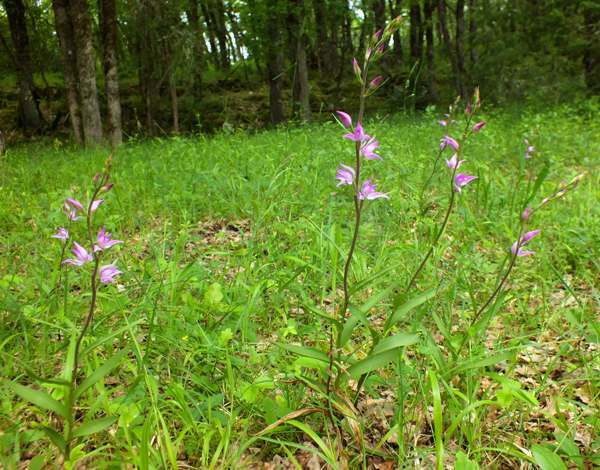 Red Helleborine Cephalanthera rubra usually grows in dark woodland habitats on calcareous soils. 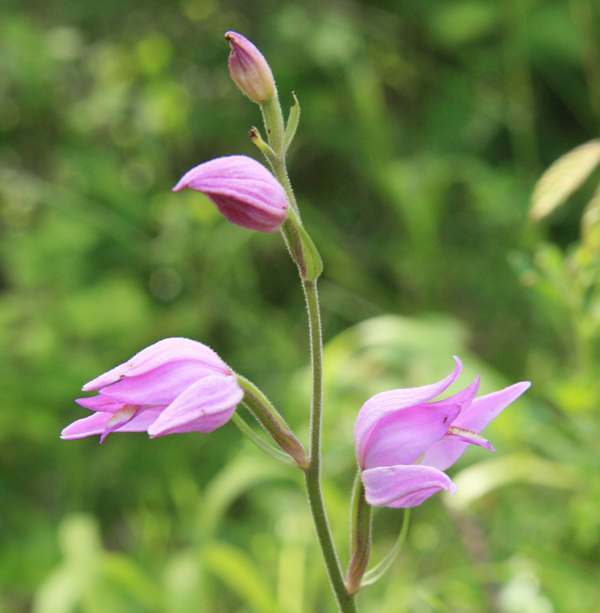 The Red Helleborine flowers from May to July. The flowers on this page were photographed in Slovenia in mid-June, when there were large numbers of plants on a shaded roadside verge and - as if this were not surprising enough - they were growing alongside numerous Bird's-nest Orchids Neottia nidus-avis, Dark-red Helleborines Epipactis atrorubens and Lesser Butterfly-orchids Platanthera bifolia.